Mary K. Elling (nee Kirk) was born on November 24, 1921 in Akron, Ohio to William and Sallie (nee Forson) Kirk. 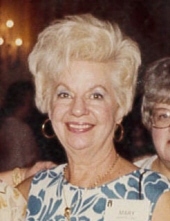 She died Tuesday, April 2, 2019 at Alexian/Amita Hospice Residence in Elk Grove Village, Illinois. Mrs. Elling worked as an Executive Secretary for Leo Burnett. Mary is survived by her son Kirk Cossiboin; her step-brother William Kirk and her best friend Robert J. Lawless. She was preceded in death by her spouse Donald as well as her parents. "Email Address" would like to share the life celebration of Mary K. Elling. Click on the "link" to go to share a favorite memory or leave a condolence message for the family.